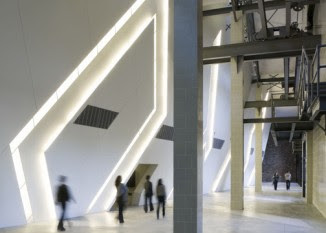 The lobby of San Francisco's new Contemporary Jewish Museum was designed by renowned architect Daniel Libeskind. SAN FRANCISCO (JTA) -- The Contemporary Jewish Museum, set to open June 8 in its new San Francisco location, is a mind-blowingly grand celebration of what Jewish sensibilities can contribute to the American cultural experience. It’s also the latest example of the Jewish museum as event rather than institution. Several things set this ambitious new creation apart. First is the sheer scale: a $47.5 million, 63,000-square-foot building designed by Daniel Libeskind, the famed architect of Berlin’s Jewish Museum and the master site plan for the rebuilt World Trade Center. The facility, which incorporates an abandoned 1907 PG&E power station into a design inspired by "chai," the Hebrew word for life, fairly screams high-concept, but in a comfortable, northern California kind of way. It’s a museum that could have been built only in California, says Mitchell Schwartz, an art history professor at the California College of the Arts. It fits a community that is highly innovative, largely unaffiliated and has not experienced the discrimination Jews have felt elsewhere. Another defining characteristic is that the museum will maintain no permanent collection, but will host temporary and travelling exhibitions. That’s partly due to its proximity to Berkeley’s Judah L. Magnes Museum, which owns the country’s third largest Judaica collection. The two institutions are still smarting from an abortive merger effort that collapsed several years ago, and are eager not to step on each other’s toes. In fact, one of the Contemporary Jewish Museum’s opening exhibits is on loan from the Magnes, highlighting what both institutions envision as a close ongoing cooperation. The Contemporary Jewish Museum isn’t the only large-scale Jewish museum to open in recent years. There’s the splashy and quite successful 10-year-old Skirball Cultural Center in Los Angeles; the impressive Maltz Museum of Jewish Heritage, which opened in 2005 in Cleveland, and the country’s newest Jewish museum, which opened last month in Milwaukee. In 2010 Philadelphia’s National Museum of Jewish History will move to a new 100,000-square-foot facility on Independence Mall. The latter three, like most Jewish museums in this country, focus on chronicling the history of a particular Jewish community. A lesser number function more like Jewish art galleries. And, of course, there are the Holocaust museums, which range from small private collections in federation offices or synagogues to the U.S. Holocaust Memorial Museum in Washington. Wolf sees the new museum as devoted to “art and ideas.” While it will host ambitious exhibitions, the art itself isn’t the focus so much as the conversations that art engenders, and the community that Wolf and her staff hope to create from those conversations. It’s a lofty goal, envisioning museum as community builder. Starting June 7, a day before the official opening, the museum will host "Dawn," a dusk-to-sunrise Shavuot celebration for young Bay Area Jews featuring live music, spoken word, film, DJ dancing and rabbi-led text study. And art, of course. The revelers will be able to wander through the exhibit halls all night, enjoying the artwork while marking a Jewish holiday. The holiday actually begins the next night, Wolf says, so as to enable observant Jews to attend. That kind of innovative programming, focusing on events that appeal to the young, largely unaffiliated Jewish generation, is more typical of what one might expect from a Jewish community center. What distinguishes it as a museum is the conscious reference back to the arts. For example, the three inaugural exhibitions are “The Aleph-Bet Project,” a series of sound pieces based on letters of the Hebrew alphabet commissioned by musician John Zorn; “From The New Yorker to Shrek: The Art of William Steig,” on loan from New York’s Jewish Museum; and “In the Beginning: Artists Respond to Genesis,” where the museum invited seven artists -- not all of them Jewish -- to create works inspired by the first book of the Hebrew Bible. Five of the artists did a morning study session in New York with Arnold Eisen, the chancellor of the Jewish Theological Seminary, demonstrating the museum’s focus on the interplay between art and ideas. That focus is illustrated also in the writer-in-residence position created for Berkeley writer Dan Schifrin, who is doubling as the director of public programming. Many of his initial offerings show a heavy literary bias, including an October hosting of StoryCorps, a New York-based oral history project that will be run by Bay Area literary darling Dave Eggers. Eggers, whose newest book is about immigration narratives, will lead a discussion of immigration and the Jewish value of tikkun olam. Schifrin himself will facilitate a book group focusing on Jewish literature that deals with Jewish art. “The book group is an innovation that will create community and bring it into the museum,” he says. Museum organizers hope these cutting-edge programs, as well as the physical design of the museum and its downtown location, will draw visitors, especially younger California Jews, who do not engage with the Jewish community in other ways.